Sure, now Groot is everyone's favorite dancing houseplant, but before the summer of 2014 and the release of Guardians of the Galaxy, no one knew a thing about this rag-tag team of misfits and the Milano they rode in on. Then a giant tree had to go sticking his fingers up people's noses and sacrificing himself while surrounded by fireflies, and our lives would never be the same. Though don't let the adorable Baby Groot fool you, this character's no seedling when it comes to superheroing. Pre-dating even the Fantastic Four, Groot is one of comicdom's oldest characters, having grown some deep roots in the Marvelverse long before sprouting into theaters and capturing all of our hearts with his altruism and love of pushing buttons. With Guardians of the Galaxy 2 blasting onto big screens, things have only gotten bigger. Except for Baby Groot, whose pint-sized hijinks will probably go down in history as the best thing to ever happen to anyone. He has a heart of green, likes to introduce himself a lot, looks adorable in tiny outfits, and is the most unlikely superhero since Robert Downey Jr. went from pushing paper on Alley McBeal to being Iron Man. So what else does one really need to know about this giant walking, talking tree? Well, as it turns out, quite a bit. Here are the 15 Things You Didn't Know About Groot. As far as monosyllabic sentient tree creatures go, they don't get any more heroic than Groot (sorry Ents). But when this wooden giant first lumbered onto the scene in 1960, he was as evil as plants come. (Save for maybe poison ivy. That stuff is the worst.) In fact, Groot was nothing more than your run-of-the-mill monster looking to terrorize the planet, like Dracula, King Kong, the Blob, or Justin Bieber. Groot was created by Jack Kirby and Stan Lee, and debuted in Tales to Astonish #13 where he was hailed as the “Monster from Planet X.” Surprisingly verbose for a walking tree, Groot spends much of his time talking about how terrific he is and all the different ways he's going to defy humanity. This includes such grandiose plans as conquering a small village and subjecting its townsfolk to experimentation on his homeworld. Fortunately, there is a biologist around to stop him. Putting his college education and girlish name to good use, Leslie Evans quickly breeds super-termites overnight to chow Groot to death. In true Groot fashion, he would return over a decade later in Incredible Hulk Annual #5 to fight the Green Goliath. As expected, Hulk smashes bad guy Groot in the most ridiculous way possible. Groot belongs to the anthropomorphic tree race known as Flora Colussus. Their home, Planet X, is capital of the branch worlds and led by the sage Arbor Masters, which bestows advanced “Photonic Knowledge” upon its inhabitants. This advanced plant education provides genius-levels of intellect to the entire race. It's unclear whether this know-how extends beyond Planet X, but there's a good chance the potted ficus in the corner of your room is smarter than you. For his part, Groot is supposedly a descendant of an ancient ennobled sap-line. While he may have been originally labeled a monster, he also goes by “His Divine Majesty King Groot the 23rd, Monarch of Planet X, custodian of the branch worlds, ruler of all the shades.” That mouthful means he received the finest education from the most gifted Arbor Master tutors, making him super duper smart. Specifically he has a tremendous grasp of quasi-dimensional super-positional engineering, which only sounds like gibberish if you're not a tree genius. It should be noted that Annihilators #1 suggests that Groot is only pretending to be a monarch, and the events of Tales to Astonish fall under his rebellious younger years, though his birthright has yet to be definitely disproven. Either way, he's one smart tree. It might seem like Groot only knows three words, but it turns out he actually has a lot to say. Due to his species having stiff, hardened larynxes, all sentences that come out of their mouths sound like, “I am Groot.” This seemingly makes communicating with Groot a futile task unless you're a talking squirrel. 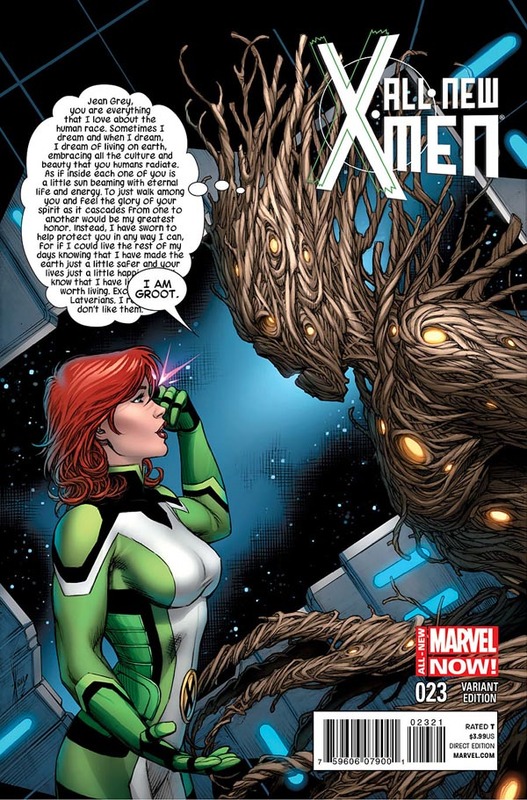 Though there was that one time Jean Grey telepathically read Groot's inner dialogue and we all realized it's probably better that we don't have to listen to him drone on, because trees are really boring. But as everyone who's fallen in love with the character in the first GotG movie can attest, words are overrated. Groot can convey a world of thought and feelings through the subtle nuanced inflections that come from him merely repeating his name. Groot's voiceover actor, Vin Diesel, is able to achievep this thanks to the dedication of director James Gunn, who even went so far as to write an alternate version of the entire Guardians of the Galaxy 2 script for just the two of them that contains each of Groot's lines in English. If you thought Groot was just a really cool name, you have got some traveling to do. In Dutch, as well as Afrikaans and Flemish, the word is translatable as “big.” Which means that if you are watching Guardians of the Galaxy in any of those countries, Groot is not so much introducing himself as he is bragging about his massive size. Exactly what part of himself he might be referring to we will leave up to you to decide, but re-watching the movie imagining that Groot says “I am big” every time does make for a far more comical experience. The word “Groot” has also made an appearance in another foreign language better known as James Joyce's Finnegan's Wake. (“Goo, the groot gudgeon, gulped it all.”) Presumably, Joyce was not referring to the Marvel superhero, but who can tell; that book makes about as much sense as a giant tree and talking squirrel being best friends. After first terrorizing a small village in 1960 and then getting smashed by Hulk in 1976, it only made sense that Groot next show up in the dreams of Peter Parker. During 1997's flashback issue of The Sensational Spiderman, a young Parker, still yet to be bitten by a radioactive spider, gets attacked by the monsters of Marvel old during a fishing trip with Uncle Ben, and Groot once again rises from the dead. In an odd bit of meta-comicology, Peter has a full collection of early Silver Age Marvel comics when superheroes had yet to capture the public's imagination and monsters like Gigantus, Blip, and Groot reigned supreme. Because he's young and nerdy, reading stories about giant, talking trees gives pre-Spidey nightmares. So when he falls asleep thinking about an upcoming outdoorsy outing with his uncle, it's not long before Groot appears and immediately tries to eat them. Luckily, right before that happens, the Vandoom Creature appears to punch a hole right through Groot's splintery face. Eventually, Peter wakes up in the sweats, and we all learn the valuable lesson that children can't handle comic books -- or large pieces of wood. The Guardians of the Galaxy were not the first team of unlikely heroes that Groot belonged to. Following his first few outings being a real jerk and trying to destroy everything in his path, the Monster from Planet X finally put his limbs to good use when he was forced to become a member of S.H.I.E.L.D. In 2006's Nick Fury's Howling Commandos, Fury recruits several of Marvel's monsters, including Warwolf, Vampire by Night, Gorilla-Man, the Living Mummy, Sasquatch, and Frank (as in stein) to fight against Merlin the magician. (Why this series didn't make it past six issues is beyond us.) Early on, this frightful S.H.I.E.L.D. squadron captures Groot (still as verbose as ever) and convinces him that fighting magicians is far more fun than scaring people, so he reluctantly joins up. As ridiculous as Nicky Fury's paranormal containment unit of B-team monsters was, had it not revived Groot back into comicdom, the character would most likely not have been included in the following year's Annihilation: Conquest and become a part of the Guardians of the Galaxy, which would have deprived us all of ever seeing Baby Groot. Thank you, Howling Commandos; the universe owes you one. After four appearances in fifty years, the Groot that we all know and love today finally sprouted. At some point, the giant tree gets freed from S.H.I.E.L.D. custody and dropped into Kree space, where he gets recaptured by the alien race known as the Kree. When Peter Quill aka Star-Lord is recruited by the Kree to help stop a universe-ending super-weapon, they fit him with a team of alien misfits that include Rocket Racoon and the now far-less hostile Groot. Thus, the 2007 Annihilation: Conquest story arc finally sees the Flora Colossus join up with the Guardians of the Galaxy. During the first mission of this newly-formed Guardians (the one that would inspire the film version), Groot sacrifices himself to save his teammates by getting blown up. Fortunately, a twig offshoot of himself survives only for Groot to shortly thereafter once again take a hit for the team by being lit on fire to incinerate a radio tower. Fortunately, Rocket saves a clipping of his new pal, and after several waterings, he would regrow to his former self, ready to dance the night away. After years of terrorizing everything in his path, Groot was finally doing some real good by repeatedly committing suicide. Ever wonder why Groot and Rocket Raccoon get along so well? One major reason could be because the giant tree has such a special affection towards small animals. Back on Planet X, squirrel-like beings known as Maintenance Mammals helped maintain the planet's ecosystem. Most of his fellow sentient saplings considered themselves above these furry creatures, but Groot saw things differently, fondly associating with them and even acting as their protector. In fact, Groot was exiled from this homeworld for killing a fellow tree (read: ripping its head off) in order to defend one of these mammals when it was being brutalized. Perhaps seeing the genetically engineered Rocket, who was subjected to cruel experimentation against his will, reminds Groot of his old furry friends. Or maybe he just likes things that sound like Bradley Cooper. Either way, Groot would make for one heck of a animal rights activist mascot. Groot has a lot of powers you would never expect to come from a giant tree. He can spontaneously manifest a fleet of fireflies, stretch his limbs as far as the eye can see and dance like a tiny boss. Not to mention turn his wooden hands into blades or talk to other vegetation. Though with regards to that last one, who hasn't sung to their plants from time to time? Best of all is when he's created multiple miniature copies of himself by taking cuttings off his trunk and letting them grow free. Impressively, each offspring retains all his memories and can even help resurrect him the next time he decides to go kamikaze. Taking things even further, these mini-Groots can germinate other plant life controllable by Groot, meaning that he literally can single-handedly create an arboreta army. We've seen Ghost Rider do something similar, as well as Superman in one of his more WTF moments, but somehow, Groot cultivating his own forest that collectively chants “I am Groot” just seems so much more delightful. Because you know what's better than one Baby Groot? Thousands! There are a lot of things we want to see in Sony's upcoming Venom movie. But probably the coolest (and most unlikely) event would be if the Symbiote were to merge with Groot. What might that look like? Well, in 2014's Guardians of the Galaxy #22, we get our answer -- and it was awesome. Flash Thompson (aka Spider-Man's ole high school alum turned war hero turned Agent Venom) has joined up with the Guardians. When the Symbiote started causing Flash to do some very weird and violent things, the team separate the two and place the alien life-form in confinement. Then Groot sets things off by getting Venom all over himself. In a matter of seconds, Venom-y Groot trashes the Guardian's ship and sends everyone scrambling for their life. It's not until Drax rips the two apart that everything returns to normal. That is until the Symbiote attaches to Rocket a few moments later. To say the least, the Venom suit has been worn by its fair share of characters. Unfortunately, like Venom bonding with Deadpool or it dressing up as Santa Claus, a Grooted symbiote is one thing we'll probably never get in a Venom movie. We don't know about you, but when we think of reality TV, we instantly think Groot. He's constantly getting into trouble, he's surrounded by crazy people, and he's always naked. So it was only a matter of time before a spineless trans-dimensional alien TV producer named Mojo kidnapped him and Rocket Racoon and forced them to star in an intergalactic reality series without their knowing. At the start of 2011's Annihilators: Earthfall, the two Guardians find themselves fighting their way through planets made of ice, jungle, and water all the while hearing a voice from above narrate the action. It's soon revealed that they are actually in a virtual reality TV studio located within the Mojoverse for the viewing pleasure of fifty trintillian viewers. On top of that, the nefarious showrunner Mojo and his right-hand man are capitalizing on Groot and Rocket's new found popularity to sell action figures. What the Flark! Luckily, the pair do what they do best and blast their way off the air. After disposing of Mojo, however, they find out how profitable their new show has become and decide to continue filming while reaping all the rewards of merchandising for themselves. Show me the Groot! Whether Groot is the last of his kind or not depends on who you ask, what year it is, or whether you watch cartoons. In 2007's Annihilation Conquest: Star-Lord #2, it is stated all the Flora Collosi were extinct, save for Groot. In 2011's Annihilators #1, Rocket visits Planet X and confusingly meets a whole forest of Groots. Jump ahead to Guardians Team-Up #8 in 2015, and Groot is presumed the last living member of his race. The comics have yet to provide any indication of what, if anything, became of the inhabitants of Planet X, but if you're to believe the animated Marvel's Guardians of the Galaxy on Disney XD, his entire race was wiped out by Ronan. There is a chance that the Groot that first appeared in Tales to Astonish was not the same that would go on to become a member of the Guardians of the Galaxy. All we can really say for sure is that Marvel has yet to get its Groot stories straight. That said, regardless if any other members of his race exist, Groot will always be one of a kind to us. Vin Diesel is often derided for his stiff acting and over abundance of mumble growls, but for our money (and yours, apparently) he's one of the best things going on big screens right now, thanks in no small part to his spot-on portrayal as Groot. 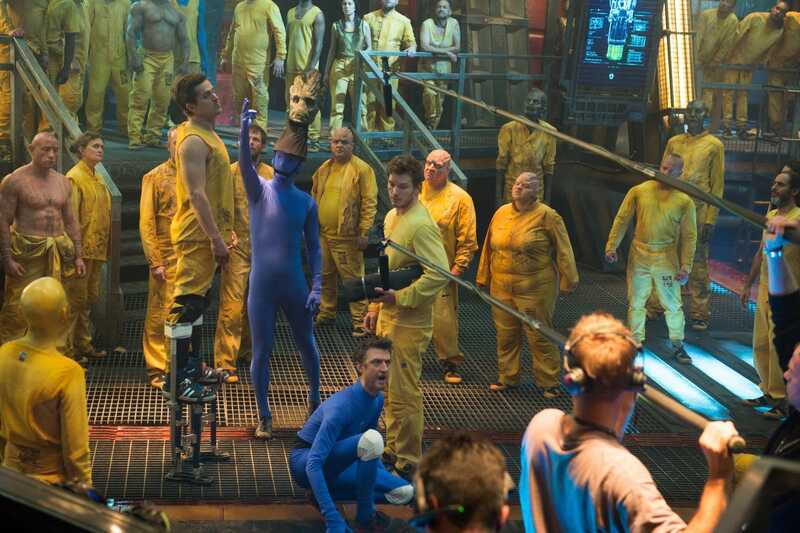 Sure, he only has one line and does all his work offset behind a microphone while presumedly wearing sweatpants, but damn if he doesn't act the heck out of “I am Groot.” To achieve such a fine performance, he recorded Groot's indelible catchphrase for the first Guardians of the Galaxy over 1,000 times to get the right intonation for every occasion. In a rare feat, Diesel also dubbed the voice work for his character in nearly every foreign rendition of the film, performing “I am Groot” in at least 15 different languages (six for the film's international premieres, and the rest for its DVD release), including Russian, Mandarin, Spanish, Portuguese, Kazakh, Japanese, German, and French. Yo soy Groot. Je suis Groot. Ich bin Groot. Я ЕСТЬ ГРУТ. Can you say them all? When Vin Diesel did his voice work for Groot on the first Guardians of the Galaxy movie, he recorded a majority of his lines on stilts so as to feel more Groot-y. During actual filming, Vin was absent, and a stand-in wearing a Groot head for a hat did all the heavy lifting. For Guardians of the Galaxy 2, it looks like the actor tried a different tactic to embody his character -- specifically, talk like a tree baby. Yes, the famously deep-toned Diesel once again provides all of Groot's dialogue, despite the fact that the character is now an infant and as such speaks like one. In fact, James Gunn has gone on record as saying that they did very little electronic audio tweaking to Vin's performance in post-production, because Diesel so perfectly nailed doing a childlike, high register. Does Baby Groot seem a little less adorable when you realize it's actually a 49-year-old grown man making those sounds? Not one bit. When you've got a character that steals every scene he's in, whether he's talking, walking, dancing, or yelling adorably, you're going to want to put him to work. Not surprisingly, it's been confirmed that Groot will appear with the rest of his teammates in Avengers: Infinity War, and even awesomely hinted at that he and Hulk will have a “few words” for one another. More off kilter, but no less welcomed, is that Vin Diesel and James Gunn have discussed doing a Groot spin-off. While some might be wondering how a hero that only has three words in his vocabulary could carry an entire film, there are actually a number of ways a Groot-centric solo movie could work. At the very least, we could imagine one co-starring both him and Rocket Racoon, which seems to pretty much write itself. They've already received their own animated web series more than proving the point. Regardless of the details, having recently been a potato head, a life-size action figure, and a Geico spokesperson, one thing is for sure -- the world wants more Groot. Know of any other rare and wonderful facts about the Monster from Planet X? Or maybe you just want to talk about how adorable Baby Groot is. Either way, sound off in the comments.